Pesticide is a term which relates to substances used to control crop 'pests', whether they be invertebrates, ‘weeds’ or plant diseases. - fungicides – for plant fungal diseases. The following field study finds that even when pollen is collected from primarily non-target crops (i.e. the crop selected for treatment by the farmer), the contaminated pollen collected nevertheless exposes honey bees to a level of risk outside of regulatory boundaries. It also finds that the risk is coming specifically from insecticides – even when the crop (in this case, apples) were not treated that particular season (note that some of these poisons – such as neonicotinoids, are persistent, meaning that they remain in soil some years after initial treatment). A link to the study is provided at the bottom of this article. "High pesticide risk to honey bees despite low focal crop pollen collection during pollination of a mass blooming crop"
The scientists conducted a field test, using a network of 120 experimental honey bee colonies placed in 30 commercial (and pesticide- treated) apple orchards in western and central New York. - The landscape surrounding an area of treated crops can strongly affect the pollen gathering habits of bees. - Despite this, even when bees foraged upon plants and trees not officially treated with pesticides, bees were nevertheless exposed to risk from pesticide residues, and specifically insecticide residues. - Scientists suggest that the surrounding area can become contaminated by pesticide residues [my note: for example, by run off or leaching of pesticides] from the treated area; or that the small amounts of pollen gathered from treated crops, nevertheless can lead to substantial pesticide exposure. - The level of risk to bees from the insectides was above the level of concern stipulated by both American and European regulatory bodies. risk from chronic oral exposure (which is ultimately likely to impair bee and colony function, and thus result in eventual death rather than rapid death) was above the European level of concern in 22 of 33 of the orchard sites. - Within the discussion, the scientists note that some insecticides have high levels of persistence in soil, meaning that residues remain in the soil for a long time following the first application (this means they can be taken up by plants in the future). They also note that other research highlights that pesticides can interact additively - i.e. when added together, the toxic effects of each or one can be increased substantially. For example, they note that research demonstrates that fungicides when used on their own, may pose no risk to bees, yet fungicides can increase the toxicity of pyrethroid insecticides to bees by up to 1000-fold, and the toxicity of neonicotinoid thiamethoxam by 8-fold. They note that 22 of the orchards used fungicides, and 14 of these used pyrethroids or neonicotinoids (note that also, other insecticides were used at the orchards). They suggest that if anything, their data underestimates the pesticide risk to bees. (1) How does landscape context govern focal crop foraging by honey bees during pollination of apple, a mass-blooming commercial crop? (3) Given different on-farm pest management practices and landscape context surrounding farms, when do these factors lead to substantial pesticide risk to bees? Landscape context strongly predicted focal crop pollen foraging and total pesticide residues, which were dominated by fungicides. Yet in spite of this, focal crop pollen foraging was a poor predictor of pesticide risk, which was driven primarily by insecticides. Pesticide residues in bee-collected pollen can be high despite non-crop sources accounting for the majority of pollen. small amounts of focal crop pollen collection by bees can lead to substantial pesticide exposure. Pesticide risk in recently accumulated beebread was above regulatory agency levels of concern for acute exposure at 5 of the 30 apple orchards, and for chronic exposure at 22 of the 30 apple orchards, where the 120 experimental hives were placed. The scientists investigated whether the levels of pesticides found in beebread represented a substantial risk to bees. They found that risk from acute contact exposure was above the United States Environmental Protection Agency level of concern at 2 of 30 orchard sites, and above the European Food Safety Authority (EFSA) level of concern at 5 of 30 orchard sites. They also found that risk from chronic oral exposure was above the EFSA level of concern at 22 of 30 orchards. 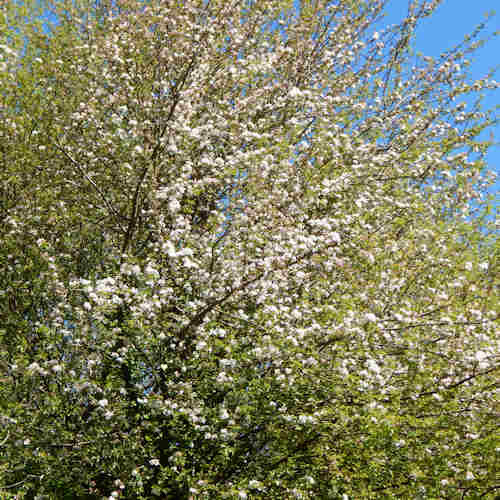 Thus, the scientists concluded that bees at the majority of the orchard sites, experienced pesticide risk exceeding a regulatory agency-determined level of concern for acute or chronic exposure during the apple bloom period. The scientists quantified 25 pesticides (14 insecticides, 10 fungicides, 1 herbicide) from beebread. The analysis captured 16 of the 30 pesticides sprayed during bloom across the 30 sites, including 9 of 12 insecticides, 7 of 16 fungicides, and 0 of 2 herbicides. 9 common pesticides were also quantified, despite not being sprayed during bloom at the 30 sites. exhibited unreliable quantification parameters and were therefore removed from the multi-residue analysis (e.g. pyrethrins). 9 common pesticides were also quantified, despite not being sprayed during the particular bloom period at the 30 sites. Among them were 5 insecticides (chlorantraniliprole, clothianidin, cyfluthrin, fenpyroximate, and imidacloprid), 3 fungicides (fluxapyroxad, myclobutanil, boscalid) and 1 herbicide (atrazine). Pesticides that were not sprayed during bloom were found in beebread at 28 of 30 sites, averaging 2.8 novel pesticides per site. Overall, 64% of the pesticides they detected in beebread were not sprayed at the respective sites during apple bloom. Because several of these pesticides were highly toxic insecticides, pesticides that were not sprayed during apple bloom accounted for 62% and 66% of contact and oral pesticide risk, respectively, across the 30 sites. The scientists found that fungicides accounted for 94% of total residues (in ppb) in beebread. However, when they calculated pesticide risk via contact and oral pollen hazard quotients (PHQ), they found that insecticides (more than fungicides) represented the majority of pesticide risk to bees, accounting for 98.4% of contact and 97.7% of oral PHQ.